In the early 1990s, the Yugoslavian state collapsed. Neighbors turned into enemies, also in Mostar. Mostar had once been admired as the most beautiful city of former Yugoslavia and an example of co-existence. Now the city was ravaged by cruel civil war. Since 1566, Stari Most, the Old Bridge, had connected Mostar’s East and West side. On November 9, 1993, this precious heritage of generations was blown up by Croatian grenades. The ruins of the old bridge became a poignant symbol for the war. In July 2004, Mostar and its bridge are again at the center of world attention. 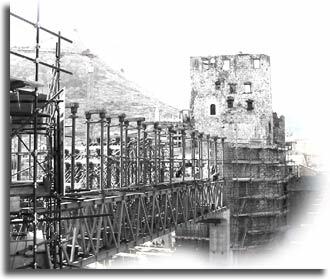 Stari Most’s reconstruction will be completed and celebrated. The people of Mostar, however, are still haunted by painful memories. Mostar has many faces and voices. Emir and Yelena are among them. Both were born and live in Mostar. Their lives were shaken up by traumatic historical events. While the new bridge is growing, these two undergo profound and fascinating changes. Young men jumping from the 19m high Old Bridge belonged to the tourist attractions of pre-war Mostar. The most courageous jumpers were Emir Balic and Jadranko Finn. Thousands of times they jumped into the green waters of the river Neretva. As friends and rivals, the two men were celebrated as heroes of the whole Balkans. Jadranko Finn was killed in the war. Emir Balic, a Muslim living in the West Party of Mostar, survived. When the idea of reconstructing his beloved old bridge came up, Emir was skeptical. Over time, it became increasingly important to him. Today, Emir Balic is an ardent and prominent supporter of the project. When the Stari Most will span the river again, Emir will will be the first man to jump from the new bridge. He will jump into the water that embraced the stones of the old bridge when it fell. He will jump, honoring the memory of his friend Finn who did not live to see the day. In the days before the war, Emir had Serbian friends from the East of the city. Yelena Milusic is the daughter of one of them. A young woman from a mixed family, Yelena has Serbian parents, Croatian relatives, and Muslim friends. As refugee in Canada, she experiences the deep pain of losing her home and her identity. When she returns to Mostar, she finds her parent’s home in ruins. Mourning her father and her city, Yelena tries to trace her childhood in the ruins of Mostar. In a slow and intense process, she recovers not only memories of the past but gathers strength to shape her future. Yelena transforms her grief into creative power. As singer and emerging star, Yelena sends her songs as bridges between the peoples of the Balkan. She will never leave Mostar again. For Yelena, the returned refugee, there is no East or West Mostar. However, she recognizes that for the survivors of the war, Mostar is still divided. Nothing can ever replace the old bridge or bring back the past of peaceful co-existence, but the city and its inhabitants have to find their way back to normality. Today, Mostar is in process of stabilization and rehabilitation that will culminate in the dedication of new bridge on July 23, 2004. Emin and Yelena will be there. The dramatic scenery of the war-torn historical city is the backdrop for an inspiring story. Wise old Emin and stunning young Yelena represent the people of the Balkan, between trauma and dream. They know that reconciliation demands more courage than fighting, and that reconstruction demands more determination than destruction. They are true survivors. “Stari Most” is based on long-term, serious research. Rare and moving historical footage lends depth to the images of destruction and reconstruction. Mostar and its people are portrayed in subtle filmic language, at all times of the year and under varying conditions of weather, light and mood. Intense and unexpected emotional drama unfolds in front of the viewer’s eyes. In an atmosphere of total authenticity, the viewer accompanies protagonists on their passage through time. The people of Mostar, dead and living, come alive in this film. In 52 minutes, the film reveals a stirring and unforgettable message of the human spirit. The author: Karsten Klein has repeatedly covered topics from the former Yugoslavian states. All of his reports won wide acclaim for their authenticity and insight; some were awarded with prestigious prizes. Even at the time of the Balkan War, Klein visited his friends there. He was the first Western journalist to enter former Yugoslavia after the NATO bombings. This personal engagement and courage has won him unparalleled respect in the ravaged region and allows him to get a story where others could not.